Espoo-based Opti Automation’s CEO Juha Marjeta had a problem: his sons’ bedrooms were never at an optimal temperature. With no off-the-peg solutions readily available, Marjeta decided to create one himself. He presented his ideas, which even he considered slightly crazy, to Jyri Seppä, and the ideas led to the launch of OptiWatti in 2014. “OptiWatti is an easy to way to save money on your electricity bill as it optimises the temperature in each room in the home, lowering it when you are away. This allows you to reduce unnecessary energy consumption. OptiWatti can help users cut their consumption by up to 40%, which translates to an annual saving of EUR 600–700. The OptiWatti technology is compatible with direct electrical heating devices and air source heat pumps,” Marjeta explains. The number one driver for the Opti Automation team is their desire to create a solution for reducing carbon emissions. Marjeta, Seppä and their partners are passionate about making change happen. Their aim is a logical fit for a company based in Espoo, Europe’s most sustainable city. “We want to raise awareness about the fact that you don’t necessarily need to have all the rooms in your home at the same temperature. With OptiWatti, you can find out exactly how much energy your home is consuming. Along with the obvious financial benefits, your home will feel more comfortable and you will be able to reduce your carbon footprint too,” Marjeta says. The OptiWatti device responds to weather forecasts, outdoor temperatures and electricity prices. It will also learn how the different rooms in the house respond to temperature adjustments. OptiWatti can be controlled remotely with a smartphone, tablet or computer. “In future, smart technologies will increasingly be used in the domestic setting as well. We approach our work from the consumer’s perspective so any user interface we develop will always be straightforward and easy to use,” Seppä points out. 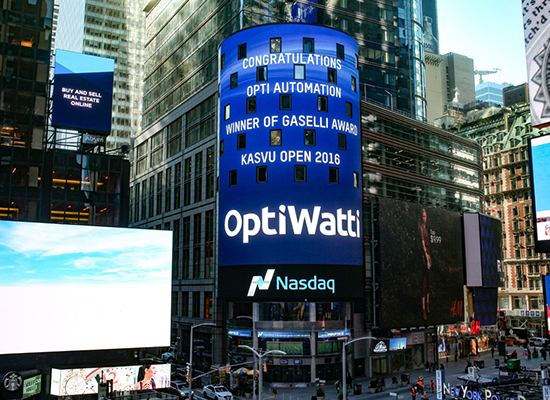 Opti Automation recently took part in the Finnish Kasvu Open enterprise programme with great success. The programme was set up to bring together growth-driven businesses and business experts and coaches. “We won an energy sector business growth prize, the Gaselli award for the fastest growth and came on top in the overall start-up category as well. It was a fantastic hat trick for us,” Seppä says, clearly delighted. Opti Automation may have always had one eye on winning but, more than anything, the team set out to find sparring partners to challenge their ideas and meet with experts who could tell them whether the company was heading in the right direction. “Gaining feedback and making new contacts is very important. The opportunities we have had to interact with lots of different people have been incredibly valuable. We have gained new collaborators through this competition and also have investors interested in what we are offering. Winning the prize just puts the finishing touch on a really successful year,” Seppä and Marjeta say. Opti Automation is growing fast. At the moment, the majority of the growth is coming from Finland but the team also have the international market, particularly the other Nordic countries and northern Europe, in their sights. In 2017, the company hopes to increase their turnover to EUR 7.5 million and generate 100 new jobs. “We are not a traditional student start-up. What we are instead is a pair of old hands with plenty of experience. We have already created new job opportunities in Espoo and we are constantly recruiting more people. There is no shortage of electrically heated properties in Finland, so the potential is huge,” Marjeta says.